The Corps is in search of a tube-launched drone with an integrated warhead that can loiter over suspected targets at sea or air and strike with deadly precision. On Monday, the Corps’ Rapid Capabilities Office with the Marine Corps Warfighting Laboratory submitted a request for information from potential industry leaders for an “organic precision fires” system that is capable of providing “fire support at distances of 40-60 km” and be used against stationary, mobile land or sea targets in all operating environments, the RFI states. The Corps wants the system to be man-portable and “launched pneumatically from a canister or tube” with a tube smaller than 10 inches in diameter and 96 inches in length, according to the RFI. The Marines want the system to be easily controlled during flight and impact of the munition. The Corps also wants the system to have long-range communications capability, so operators can link with the system at distances of 25 to 60 kilometers. And they want the “ability to engage and attack a variety to include personnel, vehicle and facilities via cursor on target and / or GPS location,” the RFI states. The U.S. military already fields a smaller version of a kamikaze-like drone called the Switchblade, made by AeroVironment. But the small packable drone only has a 10 km radius and ten minutes of flight endurance. The Corps wants its system to push nearly 60 kilometers with one to two hours of flight endurance. However, AeroVironment recently conducted a successful test of a hybrid system onboard a U.S. Navy coastal riverine craft that uses a larger RQ-20 Puma surveillance drone in conjunction with the Switchblade, according to an April press release. The RQ-20 packs a 15-kilometer range and nearly three hours of flight endurance, and conducts surveillance of suspected hostile targets. The Puma can pass on coordinates to smaller Switchblade drones that engage and destroy enemy targets, according to the company’s press release. 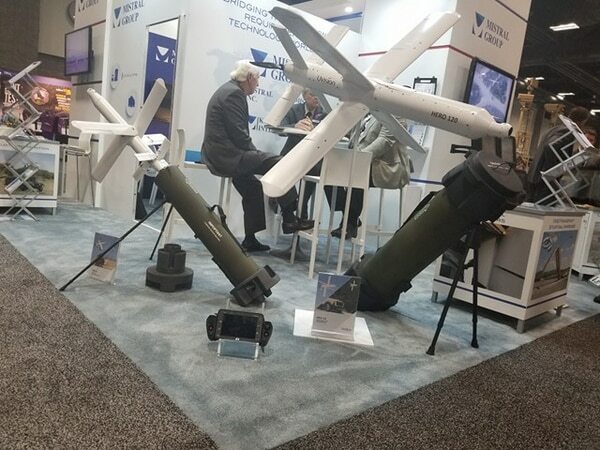 “This new combination of our Puma unmanned aircraft system with our Switchblade loitering missile system gives commanders unprecedented ability to identify threats at long ranges, limit collateral damage and wave off targets subsequently deemed neutral or friendly,” Rick Pedigo, vice president of AeroVironment’s Tactical Missile Systems business, said in the press release. But Mistral’s Uvision drones may come closer to what the Corps is looking for. Mistral makes two pneumatic launched tactical missile drones called Hero 30 and the larger Hero 120. The drones have a 30 minute and one hour loiter time respectively. They are both relatively small, weighing less than an FGM-148 Javelin anti-tank missile. The Marines have been experimenting with various systems for dual use purposes like the firing of a HIMARS artillery rocket systems from the deck of a Navy ship. 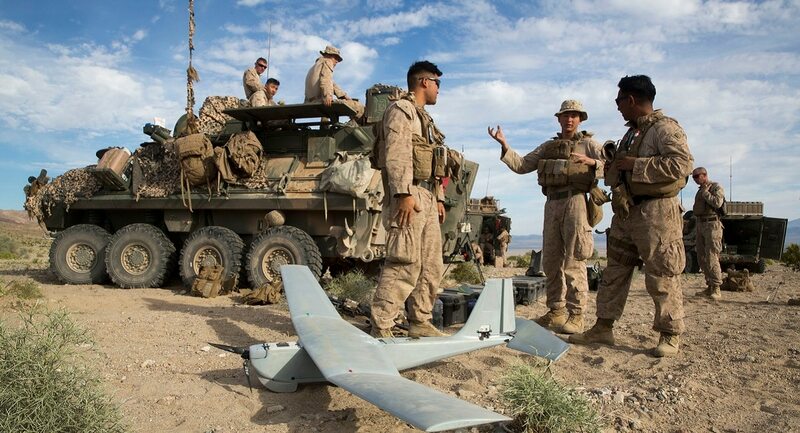 The development also comes as the Corps is issuing small quadcopter drones to every rifle squad, a program routinely called “quads for squads” by Corps officials.